Here’s a great documentary on how technology is “protecting” us but compromising our “privacy”. It is another example of the tyranny of the default. Basically, having so many devices freely connected to the Internet with effectively no security is a gift for those willing to look and exploit. If you have an Internet connected device ensure the password is CHANGED. Do it now because insecure systems affect every Internet user. Watch the video and change those passwords. It has been brought to my attention that this post has figured in a recent APAC Google Enterprise newsletter. Having seen the newsletter and being disappointed in the negative approach it has taken to Office 365 I have decided to provide the following points to balance the attempt to insinuate in any way that Office 365 is inferior by what I detailed originally. 1. In no way does the issue below prevent Office 365 services (such as email and collaboration) from operating or reduce their functionality in any way. 2. The subset of customers who this applies to is extremely small when compared to the overall market. 3. Alternate solutions from Microsoft are available. 4. The inclusion of full desktop productivity applications is something that no other vendor provides, to my knowledge, with their cloud offerings. 5. Each qualifying user can install Office desktop software, for MAC or PC, from Office 365 on up to 5 devices. 6. This is the way the product has always been (since Office 365 was launched), so nothing has effectively changed. 7. I still firmly believe desktop software via Office 365 provides the most cost effective solution for customers looking to keep up to date with the latest products they are familiar with, want to use and will work with and without an Internet connection. Let’s see all products compete on what benefits they provide to end users and not waste energy elsewhere. I leave the original post unchanged below and also point out that at any time in the future this licensing can be changed. Please note that this post supersedes any of the information I have posted previously on this topic. I also hope I have all this right (fingers crossed). Any Office 2013 Professional Plus product purchased via the Office 365 console is NOT licensed for Remote Desktop Services no matter what the SKU or plan. “Office 365 ProPlus is supported on user-dedicated virtual desktop infrastructure (VDI). To use Remote Desktop Services (RDS), you must use a volume license version of Office Professional Plus 2013, which is available on the Microsoft Volume Licensing Service Center. For more information, see Microsoft Volume Licensing” Product Use Rights. This therefore means that WITHOUT Office 2013 Professional Plus Volume Licensing you cannot run use an Office 365 version of Office 2013 for Remote Desktop Services via ANY license. Again, if you have Volume Licensing then the M SKU allows Remote Desktop Services. I just got confirmation from the license team. Both service description and PUR are correct. If customer purchases Midsize business plan from Office 365 portal, this M plan does not have rights for RDS. However, if customer purchase Office 365 Midsize business through an Open Business agreement(Volume license), this M plan has rights for RDS. That is why Office 365 service description lists M plan does not have RDS access permission (as it is for customers who purchase from O365 portal) and PUR lists Office 365 M plan has RDS access permission (as it is for customers who purchase via Volume licensing). I hope this information address your question. Now the issue here in Australia is slightly different as for purchases of <250 generally they are completed through the exclusive syndication partner, Telstra. This includes the M SKU. That being the case, the M SKU is therefore not available to be purchased in Australia via Volume Licensing. So, in Australia, the M plan is also excluded from Remote Desktop Services. 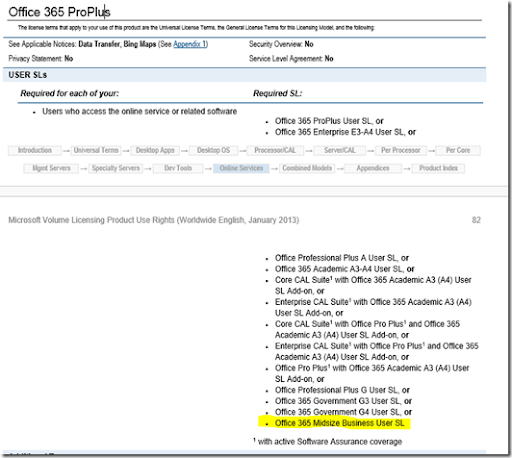 I believe you have been blogging on the licensing construct for RDS in Office 365. I wanted to make sure that you have the official response from Microsoft as it relates to Office 365 and specifically in Syndication in Australia. 1. When you purchase any Office 365 plan from the portal or via a syndication partner Office 2013 Professional Plus DOES NOT include Remote Desktop rights. 2. 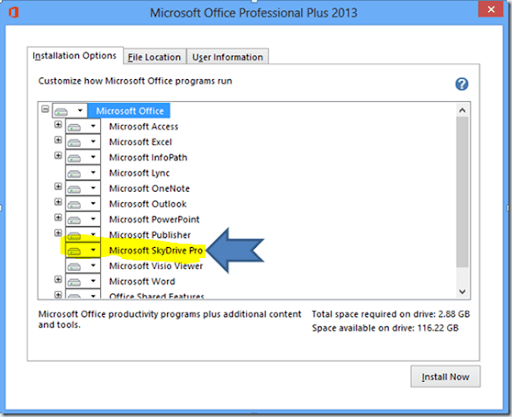 To receive Remote Desktop right for Office 2013 Professional Plus via Office 365 you need to have an Office 2013 Professional Plus Volume License. This means that Office 2013 Professional Plus via Office 365 basically has the same rights as the previous version of Office (2010 Professional Plus) had, that being no Remote Desktop or Terminal Server. I’m sure that is going to disappoint many and I hope Microsoft does change this soon. where early bird entry is still available for $44 which covers entry, refreshments, wifi and more. You see presentations on Office 365, Windows 8, Private Cloud, Samepage and more. and I hope to see you there on the day. So you have gone out and bought the latest bright new shiny Office 365 package that includes Office 2013 for your business. You figure that one of the benefits of Office 365 is that you’ll be able to insure that all your machines will now have the same version of Office. That is a GREAT idea but it over looks one VERY IMPORTANT point. Office 2013 requires Windows 7 or better to install. It WON’T install on Windows XP. I am beginning to see so many people looking to Office 365 as a way to update their in house software which is fine and dandy provided they are still not running a 10+ year old operating system like Windows XP. Sure, you may have saved some money by not upgrading to Windows Vista and 7 but guess what? To use the latest software you still have to make a jump to at least Windows 7 and that generally won’t be cheap. So again, consider very carefully how long you elect to not upgrade the software that your business runs. The longer you wait, the further out of the supported window you become and when you have to upgrade you are going to need to jump a long way to catch up. That single jump generally is more expensive and disruptive than a number of smaller increments (but I’m sure some people will argue otherwise). However, at the end of the day if you purchase Office 2013 in flavour make sure that all the machines you plan to install it on are running at least Windows 7. A while back I wrote a post how Office 365 now allows Remote Desktop (Terminal Services) with the included Office version that comes with the plans. The gist of that post remains correct however what I have now determined is that not all Office 365 plans that include Office 2013 as part of their plan are entitled to be used in a remote environment. Here you can see that Office 2013 is only licensed for Remote Desktop Services (RDP) with the stand alone Office Pro Plus, E3 and E4 plans. It is not available (according to this) for the Office 365 Small Business Premium or Midsize Business. indicates that the Midsize plan does have Remote Desktop Rights. I expect that this confusion will be cleared up shortly and when I hear more I’ll post it here so stay tuned. Here are some post I think worth revisiting that I penned in the month of March in years gone by. Search Server Express on SBS 2011 – Gotcha’s and the release of my eBook on the subject. Another health warning – We all need to spend more time doing something about our health. Getting Started With Companyweb 2010 – Some information and the release of my eBook on the topic. Cloud security – my thoughts on why the hysteria doesn’t match the reality. I’m not the only one – The changing reseller landscape. Media hysteria – No wonder people are afraid of computers and the Internet. Kakrafoon – Is Twitter something Douglas Adam foresaw? The Vista debacle – Interesting given the current debate over the slow adoption of Windows 8. Re-thinking managed services – Thinking on the changing face of technology businesses. The synchronization of files from SharePoint Online 2013 to a Windows desktop can be achieved by what I call a SkyDrive Pro App. This is a small program that once installed, monitors for changes between the local Windows machine and SharePoint 2013. When it finds changes it does a sync. So if you don’t have Office 2013 Professional Plus you won’t get the SkyDrive Pro app and you won’t be able to perform synchronization to your local desktop. As you can appreciate this is a major limitation for people using the new SharePoint Online. Much like the consumer version of SkyDrive they should have made this SkyDrive Pro app available for free so that you didn’t need Office 2013 Professional Plus to get it. There are however rumours that the SkyDrive Pro app will soon be available for free and I certainly hope this is the case for otherwise it is going to stymie the uptake of SharePoint Online, especially for those not currently having Office 2013 Professional Plus.